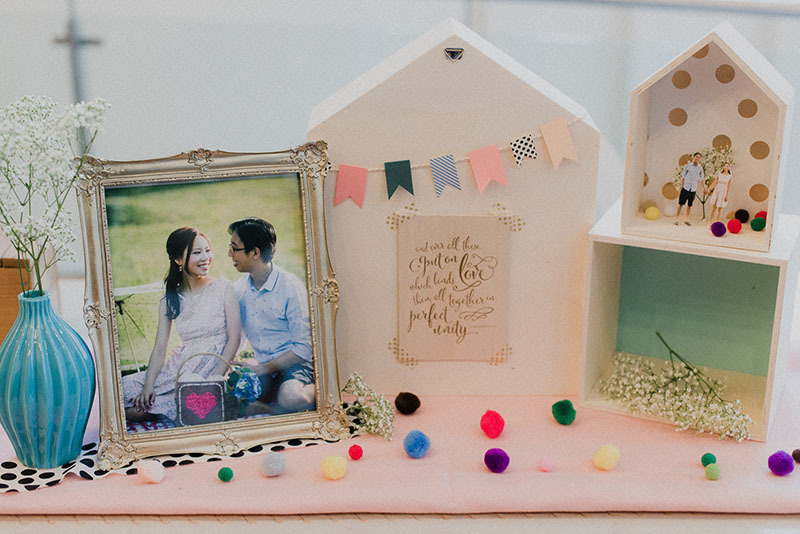 Dawn and Ming’s eclectic wedding at Singapore Thomson Road Baptist Church was filled with bright pops of colour in polka dotted vases, pom-pom clouds, and geometric details. Dawn and Ming’s wedding journey began the day he proposed in a snowy foreign land with a thoughtfully designed ring, after Ming sneakily psyched Dawn out a couple of days earlier! Held in the place where they first met, their brightly modern church wedding on 10 January 2015 is full of adorable paper crafts and happy florals. Ming: We first met while we were in church working together on an exhibition. A few years later, through a group of church friends we got to know each other better, and I recall a time when Dawn was trying to complete her final year project submission, and in the name of being helpful, I offered to help with punching some holes on her project! It was probably a mistake because I made it worse! Haha but I guess it made my mark on her! Yep, eventfully we got closer through a church camp and in God’s timing it all worked out perfectly. What was it about each other that sealed the marriage deal? Ming: I knew the first thing I had to do was to come up with the engagement ring.. Dawn wasn’t particular about the size of the diamond, but I knew it was the heart of it that mattered. I came up with a ring design and sought the magical help of Evelyn from Fairy’s Inc. We managed to craft a simple double heart diamond ring studded with little yellow diamonds for her. Armed with that, the rest of the proposal was simple! *or so I thought* Haha, anyway to cut the chase, the proposal involved snow, treacherous terrains, and going down on my knees with a guitar, all with a hospitable host of friends in Taiwan! Dawn: The actual proposal was a simple affair in the comforts of a home.. it was the journey there that involved snowy terrains haha! A few days before he proposed to me, we visited a Paper Church in Taiwan and he got down on his knees, held my hand briefly, and I was like OMG HELP ME PLEASE. IS IT REALLY HAPPENING? And then he said he was just tying his shoelace. -__- Please guys! Don’t do that. He said he got the idea from a video on Youtube! Oh but anyway I love my engagement ring, so I can forgive that! We went on to design our wedding bands from Evelyn as well! Stepping into Fairy’s Inc. for our appointments with the ring fairy was one of my highlights from the entire wedding planning process! Your wedding was so bright and modern! How did you choose that theme? Dawn: They helped us by coming in from a neutral perspective, picking out what we each like personally and tying them together! Without them, I think the wedding would have been either too clean-gray-lines or an explosion of confetti! We finally settled on a homely and cozy setting with all our favourite little things, in a place full of our favourite people, and most significantly the place where we met! What was your wedding day like? Ming: All I remembered was smiling from ear to ear all the way and the rest was just a blur.. Thank God for Fiona’s and Daniel’s photography that helped to capture all these precious moments! Can you share with us the most memorable moment of your wedding? Ming: The most memorable moment of the wedding had to be for me, the look of my wife’s face, of course all the others were also memorable in their own ways such as the speech and walking along the aisle, but her smile and laughter just brought me much comfort thorough out the wedding! Can you tell us the cost of your wedding? Without adding our dinner banquet, it was probably around 40 – 45k. The Engagement Ring and Wedding Bands: Evelyn from Fairy’s Inc. The Photobooth: A Canon Selphy Photo Printer manned by our wonderful church friends! The Wedding Favours: We had lots of different wedding favours! If you’re one of the lucky 120 who got a lasered wooden card, it’s by Weiyung from Big DesignCraft. Want to see your love story featured too? Submit your wedding to SingaporeBrides here!